According to the American Diabetes Association, nearly 26 million children and adults in the U.S. have diabetes, and another 79 million Americans are at risk for developing Type 2 Diabetes. Type 2 Diabetes is the most common form of the disease, and it occurs when either the body does not produce enough insulin or the cells ignore the insulin. Insulin is important because it allows the body to use glucose (which the body makes by converting sugars and starches in foods) for energy, and it actually moves the sugar from the blood into the cells to be used. When glucose builds up in the bloodstream instead of going into the cells, it can lead to life-threatening complications if left untreated. While there’s no cure for diabetes, the disease can be managed by eating well, exercising, and using diabetes medications to regulate blood sugar. When my colleague Eston referred me to Bill Howell, a quality professional who was recently diagnosed with Type 2 Diabetes, I got to learn firsthand how diabetes can be controlled successfully. And because this is a quality improvement blog, you can bet that Howell chose to manage his disease with nothing other than Six Sigma and statistics! Howell had a hunch something was wrong—he was always thirsty, and he began to suffer leg cramps and vision loss. A diabetic coworker encouraged him to test his blood glucose level, and he found his results were so far from the norm that the meter couldn’t even calculate an exact result. A few days later a doctor diagnosed Howell with Type 2 Diabetes, and offered him recommendations for diet, medications, and a plan to regularly monitor his blood sugar with blood tests. Since he managed many quality improvement projects in his job, it was easy for Howell to to think of his symptoms as defects that could be eliminated by completing a Six Sigma project. He divided his diabetes plan into Six Sigma’s five DMAIC phases (Define, Measure, Analyze, Improve, Control), and chose to rely on his project “sponsor,” his physician, for guidance. He began by defining the problem he needed to solve, the impacts he sought to lessen, and crafted a goal statement. Since his symptoms corresponded to high blood glucose, he wanted to bring his levels below 125 mg/dL, which is a normal target level. To reduce symptoms naturally and curb dependence upon medication, Howell also wanted to strictly follow his doctor’s recommended plans for diet, medication, and blood testing. As a Six Sigma practitioner, Howell also knew he needed to verify that his blood glucose measurements were reliable. To make sure his glucose meter produced valid results, he followed the manufacturer’s weekly calibration procedure and recorded the calibration results over time. By graphing his results, he confirmed that his values fell within the manufacturer’s calibration limits. But he still wondered about the potential effects of drawing blood from different locations on his test results. Howell’s doctor encouraged him to draw blood only from his fingertips to control for any variability due to location of the testing site. But did it matter which finger he drew the blood from? To find out, he created a randomized pattern of numbers from 1 to 10, assigned each of his fingers a number, and then tested them in the randomized order. 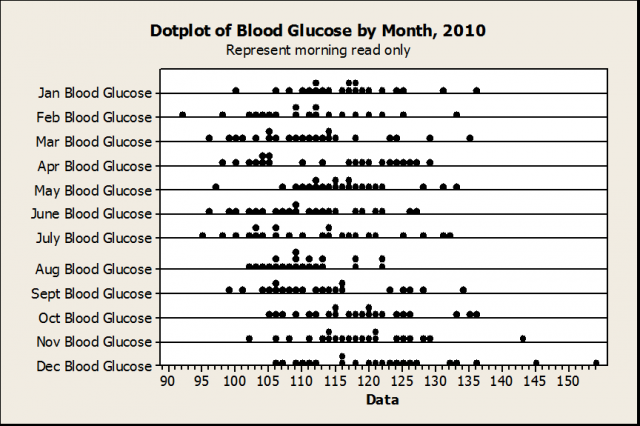 Howell recorded the glucose levels for each finger tested and charted the results using a dotplot. 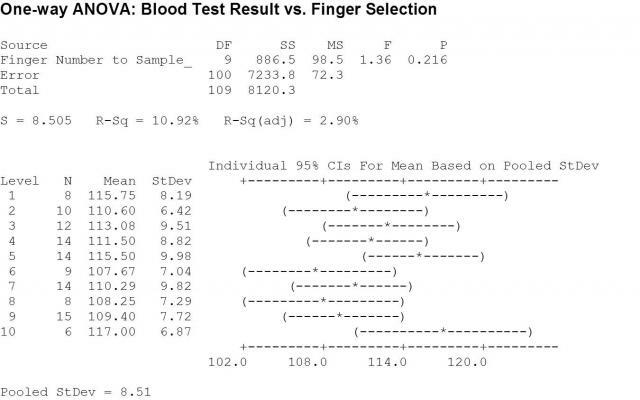 The plot revealed that groupings of test results shared the same random pattern, which suggested that finger selection did not impact the test results. He also performed a One-Way Analysis of Variance (Stat > ANOVA > One-Way) to offer further statistical proof of equality between fingers. 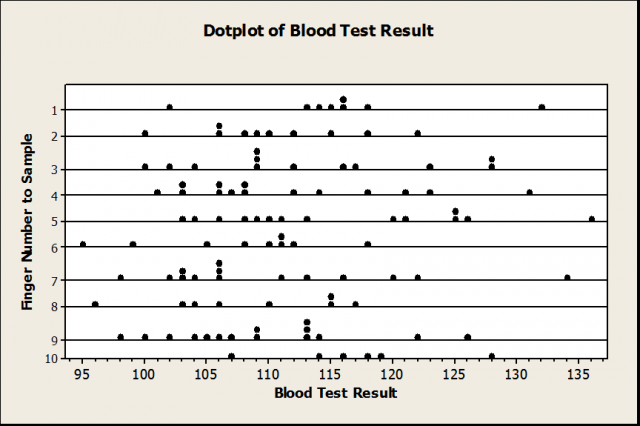 The analysis aligned with the dotplot findings, and revealed no evidence that a given finger will impact the test outcome. Now that Howell was confident his measurement system produced valid results, he wanted to assess the potential causes for his increased blood glucose levels. 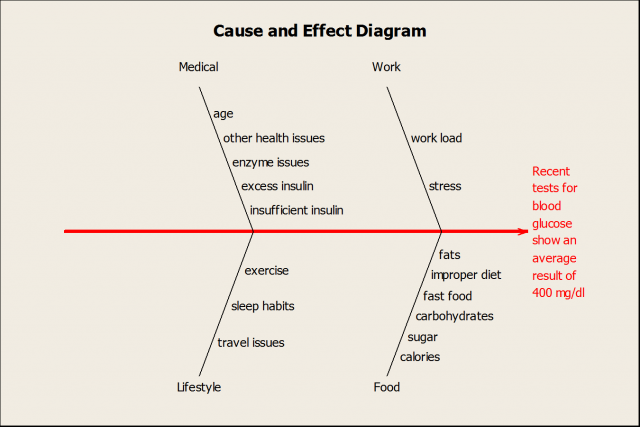 He created a cause-and-effect diagram in Minitab (Stat > Quality Tools > Cause-and-Effect), and chose to focus on causes he could control and analyze himself, such as diet and exercise. Pinpointing causes helped him plan for the next step of his project—recording his daily food intake. Stay tuned for Part II to find out how Howell organized and analyzed several months of daily diet and blood glucose data, and what he found out that helped him keep his diabetes in check. For more information on diabetes, a great resource is the American Diabetes Association web site: http://www.diabetes.org. 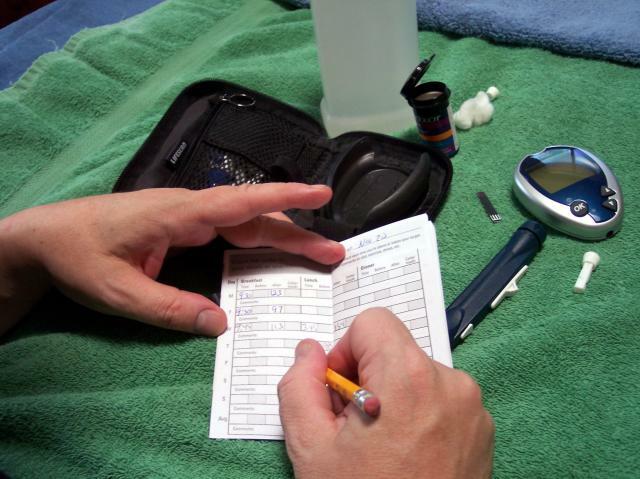 Diabetes image used under Creative Commons Attribution ShareAlike 3.0 license.